Chickpeas are a great source of protein and fiber, and at our house they have become a great meat substitute for our “meatless” nights. Without the saturated fat, hormones, and hefty price tag that meat can have, chickpeas can be a healthy and cheap way to start a meatless night tradition. 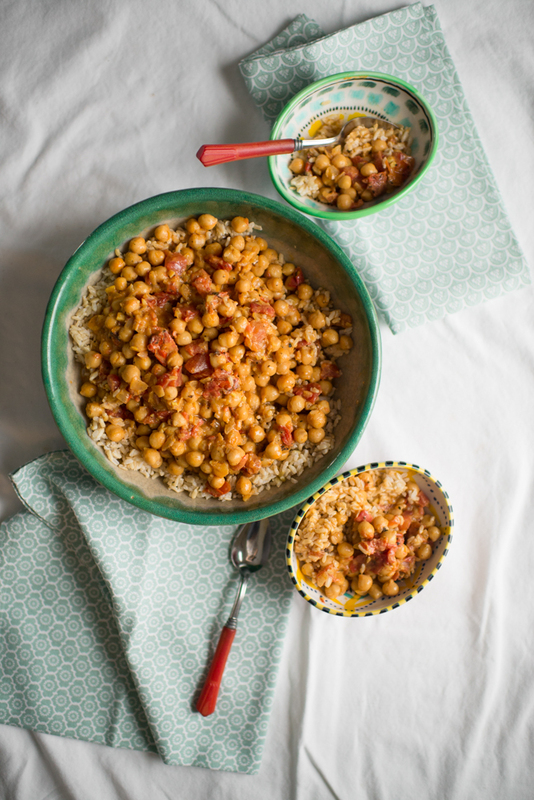 This chickpea curry recipe uses curry powder to add flavor, cayenne pepper for a little heat and some coconut milk to smooth and mellow out the sauce. The result is delicious! I use Eden Organic canned chickpeas because their can linings are BPA-free. You can also used dried chickpeas. Soak and cook about 1 + 1/3 cup dried beans until softened, and measure out 3 cups cooked for this recipe. I have been buying powdered coconut milk from the Asian Market (Five Mile International Market in Fredericksburg) which can be mixed with warm water to make coconut milk. Heat oil in a small wok or large saucepan on medium. Cook onions until soft, about 5 minutes. Add ginger and garlic, and cook 1-2 minutes until softened. Add salt, spices and diced tomatoes with juices. Heat and simmer another 1-2 minutes. Add chickpeas and cook for 2-3 minutes. Add coconut milk and water, and bring to a simmer for another 5-10 minutes. Add additional water to thin the broth as needed. Top with chopped cilantro. Chickpeas are a great source of protein for new eaters. Take some of plain chickpeas and warm coconut milk and run it through your mini food processor to make a smooth puree. For more advanced eaters take some of the chickpeas and sauce (spice with cayenne pepper for the rest of the family after taking baby’s portion) and puree or smash with the back of fork until you get the desired consistency.